I Have a Jiu Jitsu Injury! Now what? So it happened. You were in the middle of an intense jiu jitsu sparring match attempting to exert your will on your training partner. You felt something happen and it didn’t feel right. Maybe you rolled an ankle, torqued a knee, or your thumb was caught in a gi (you know, that suit of pajamas that people who train martial arts wear). Maybe you were stacked, and you felt something pop in your neck. Rib popped. Elbow hyperextended. Didn’t tap soon enough on a toehold. You hit your head after being thrown. Maybe you hit your head on something hard, like another skull and you are bleeding out of a cut (laceration). Your nose is bleeding. Whatever happened, it didn’t feel right. The longer you train in the ‘gentle art’ of jiu jitsu, the more likely it is you will have an injury. It is almost guaranteed. Now what? The following will be a brief overview of what to do after an injury. I would like to break up the discussion of injury into four parts. The first will be the assessment and some basic pointers on how to determine whether you can stay in the gym or if you should go for immediate emergency evaluation. Next is a rundown on basic treatment for sports related injuries. Third are some pointers on when to return to the mat. The fourth is a conclusion and summary of some take home points. The initial goal for any evaluation is to determine severity. We have to ask the question, “Do I need to go to the hospital now or can I wait?” I would queue into what part of the body is injured. There are many possible scenarios and the injury list is also too complex to discuss, but there is a simple way to determine what needs to be seen immediately. We have to determine risk for lifelong debilitation and something that could be much worse. The first system that jumps to mind is the neurologic system. Is there a head or neck injury? The head injury deserves some discussion. Most head injuries are witnessed, giving us the best piece of information. Was there loss of consciousness (LOC)? If yes, I would consider going right to the ED. And by loss of consciousness, I mean a period of non-responsiveness witnessed by someone around you. Any head injury in which there is altered level of consciousness also likely needs emergent evaluation and serial exams to clear back to practice. Acute signs of a significant head injury include witnessed loss of consciousness, altered mentation (thinking patterns), confusion and vomiting. Consider EMS transport to a local ED for emergent evaluation. The neck is another key body area from an acute standpoint. Any trauma associated with a fall, throw from any height or axial compression (think the worst stack pass of your life) could injury the neck. There may be a head injury involved. Again, bystander history is key. If there is any concern at all for neck injury, immobilization is required and emergent attention should be sought. EMS transport is recommended to a local emergency room. Do not move or let the injured member move. Other muscular skeletal injury is another consideration, to include extremities, lower spine and chest wall. These tend to fall into the ‘less severe’ category and usually can wait to be seen if they need to be seen at all. The one caveat would be a dislocation or unstable/deformed fracture. Quick mat side evaluation after the event will reveal this. Is anything deformed? Is there full range of motion (FROM)? If not, you will need urgent if not emergent care. A dislocation gets harder and harder to reduce as time goes by. As the soft tissue surrounding the injury swells, it can impede the reduction of the joint. An unstable fracture can risk long-term dysfunction if it is not set properly. These two scenarios need quick care by a specialist trained to take care of this. It may need to be done under conscious sedation in an ED setting. Let’s say that there is not a deformity. What should we do? Can we immediately start to train? Most soft tissue injuries are extremely difficult to assess immediately after the injury unless there is gross malfunction and inability to use the injured body part. These types of injuries take a little more finesse to assess and rule out significant underlying soft tissue injury. They take patience and observation, sometimes from an experienced clinician. They will likely take some days to figure out. If something happened that interfered with your roll, I would stop, cool down and await reassessment. It is the safe and smart thing to do. The nose injury may be discussed here, as this is a common injury on the mat. Nosebleeds will stop with direct pressure. Over 90% of nosebleeds are anterior, meaning they are in the soft part of the nose. They will stop if you simply pinch them. You can apply damp packing, but remember to put enough packing in to cause pressure. Remember not to tilt your head back if you have a bleed. It will just cause the blood to run down the back of your throat, which is almost always distressing. A bleed that does not stop after pinching the nose for 15 minutes or one that is not controlled at all with pinching the nose needs emergent evaluation. I would not try to ‘set’ a deformed nose in the dojo. Even experienced ED providers will leave this to an ENT specialist. Mouth injuries can include lip bruising to lip lacerations all the way to dental injury. Dental trauma will need a dentist, but in the event of a tooth avulsion (knocking out the tooth) emergent care may be sought so that it may be replaced. Remember to put the tooth into some milk and be seen within in the hour, as after this amount of time tooth death is very likely. There are various miscellaneous skin injuries from scrapes and bruising, all the way to lacerations. Use your better judgment. Generally if a cut in the skin is longer than the width of your pointer finger, there is fat extruding from it, or bleeding is not controlled, it will need a repair. For anything that has been deemed high risk such as head or neck injury or gross musculoskeletal deformity, treatment should be guided by an experienced emergency care provider. Many other injuries, however, can be managed independently. For basic first aid for acute musculoskeletal injury, think RICE. Rest, Ice, Compression and Elevation. Pain medication is also a viable option. Of course this is severity and injury specific, but this holds true with most musculoskeletal injuries (think sprain/strain/possible fracture). We do this early and aggressively out of the ED, but this can be started seconds after the injury, in the dojo and can significantly assist to control pain. Rest is simple. Take it easy. Stop moving. Get off the mat. Some things need time. Be patient. You will be able to train momentarily. Splinting/wrapping injured areas can help keep things from moving. A classic simple splint would be buddy taping an injured finger to another finger. Ice can be applied immediately after the injury, while in the dojo. Remember that real ice stays colder longer than the cold packs. I recommend limiting cold exposure to 20 minutes at a time. You may reapply the ice every 1-2 hours for the first day to minimize swelling, which will thereby decrease pain. Compression can be done with all sorts of specialized compression wraps from the elbow and the knee to the ankle. You can use an ace wrap as well. Just don’t wrap too tight. The color of the skin should be the same on both sides of the wrap. Elevate any extremity. The ankle can be propped up on a pillow. The arm can be placed in a sling. For pain control, I recommend take some sort of anti-inflammatory combined with an over the counter pain reliever such as acetaminophen. You can take both at the same time. Ibuprofen (Motrin/Advil) and Naproxen (Aleve) are popular anti-inflammatories. Please follow the direction on the bottle. Generally an adult over the 160 pounds can take 600 mg of Ibuprofen (that’s three over the counter pills) every 6-8 hours or 450 mg of Naproxen (2 OTC pills) every 12 hours. Do not take both because they can be damaging to both your stomach and kidneys and they offer no benefit. You can also add a dose of acetaminophen (Tylenol) to the anti-inflammatory. Over 160 pounds can take 1000 mg every 6 hours and under this should take 650 mg every six hours. These are conveniently sold in bottles marked Regular and Extra Strength for the 325 and 500 mg pills respectively. If something is bleeding, put pressure on it. Wrap it up with a bandage after rinsing it off. You will later need a thorough cleaning, either by a medical profession, or by yourself. I would not do this in the gym secondary for concerns for wound cleanliness. The best time for reassessment for minor musculoskeletal injuries would be once you are cooled down for a few hours, or better yet, the next morning. If you did not seek medical attention, go slowly with introducing movement. Put the affected joint/limb through full range of motion (FROM). Go through basic functions of the extremity. Bear weight if it’s in the lower extremity. If it doesn’t work right don’t use it. If that pain/dysfunction persists for more than 5-7 days, seek medical attention. There is possibly something wrong. If it is only slightly uncomfortable with basic activities, use it, but take it easy. If it does feel ok, meaning you can walk on it and move it with only mild discomfort, then you may actually benefit from getting back on the mat. Maybe only technique training should be done until it is definitely improving. Exercise, when done right, can promote healing. Head injuries are a special case. For any injury that ‘rang your bell’, I would recommend professional follow up and clearance to return to training. For any LOC and persistent mentation changes, emergency room follow up should be sought out, as you may need imaging to make sure there is no bleeding in the brain. The emergency professional will need to make this call based on history and physical exam. Lacerations need to heal. Please follow the directions of the doctor that put in the stitches. For the most part, I do not recommend significant strenuous activity while the stitches are in. This could be anywhere from 5-12 days. A week is a good rule of thumb. If you feel it’s injured, it could be. Take a break from the action and assess the situation. Better to be safe than sorry. Remember you are investing in the future of YOUR jiu jitsu. If it’s deformed get immediate attention at a local ED or Urgent Care. Early intervention is paramount to fixing any significant issues and treating severe pain. Significant head/neck injuries likely need emergent evaluation and professional follow up by trained medical professionals. For musculoskeletal injuries, RICE of the affected body part. Prompt treatment of the injured body part can dramatically reduce the amount of pain you have in the next 12-24 hours. Take an anti-inflammatory (Ibuprofen or Naproxen but not both) and acetaminophen. These medicines are over the counter, relatively inexpensive and can make you feel better. Wounds/skin breaks may need medical attention to reduce the risk of infection if bleeding persists after holding direct pressure for 10-15 minutes, there is gaping of the wound, or if it looks like it is deeper than the superficial layers of the skin. Pinch a nosebleed! It will likely stop it from bleeding. For those of you who decide not to be seen immediately by a medical professional, if you cannot normally use the affected body part within 5-7 days you should seek a medical professional. You may need imaging. If you have minimal pain with FROM after a brief warm up the next day, gentle stretching and OTC medication, get back to training. What are you waiting for? Likely you are not significantly injured and the activity will promote healing. As always, play smart and be safe. Due to the nature of the sport and seemingly unending variety of injuries, one needs to be smart and take care of their body. Remember jiu jitsu will be there when you heal up. 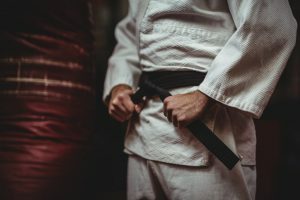 This writing is not intended to be a definitive guide for management of all sports related injuries, rather a discussion offering some basic advice for management of some common acute injuries that one might suffer while practicing jiu jitsu. This is not a replacement for medical attention. Feel free obtaining the advice/opinion of your trainers or other medical personnel for any questions you may have regarding your specific injury. Paul Streiff is a board certified Physician Assistant (PA-C) with active state and national credentially currently practicing in an emergency room in downtown Milwaukee, WI, since 2003. He has been training jiu jitsu in Grafton, WI since the beginning of 2010.